There are many reasons for building muscle in your dog. Not all of us tussle our furry friends in athletic competitions or work our dogs. Every dog, whether an athletic breed or companion dog, from toy to large breed will benefit from muscle gain. Not only can it make your dog look better but provides real health benefits and improved quality of life. As with humans, building muscle and gaining strength has many positive effects on your dog. There are three main factors in building muscle, nutrition, exercise, and genetics. Making sure your dog has proper nutrition is the first step in getting a healthier dog. It is important to have a high quality food. If you were to eat fast food or other low quality food items as the main staple of your diet it doesn’t matter how much time you spend at the gym. Same goes for our dogs. If you are feeding them low quality foods they will not get the nutrients they need to build muscle and live a healthier life. Exercise is another factor to consider when getting your pooch in shape. It is important to not go too hard right off the bat but slowly and gradually increase the duration and intensity of physical activity. The Genetics of your dog also plays a factor. Some breeds, especially in the Bully family, are prone to gaining muscle due to selective breeding. If you have a dog that is not in this category you can still build muscle on your dog. It may come a little slower and they may not be able to gain as much as some others but you can definitely make a difference for the betterment of your dog. So what are some benefits from building muscle in your dog? I’m glad you asked! 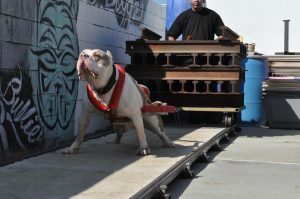 Increasing your dog’s strength will not only make him look better but feel better. If you have a dog that plays with other dogs or does any form of activity they will be able to go longer and get more enjoyment from it. It will also help prevent injury to their joints. Increasing the range of motion is one of the best injury prevention methods out there. It can also help heal from post surgery and help prevent arthritis and other long term adverse effects. This speaks for itself. The more cardio work your dog does the more fit they will be. If you are doing a lot of cardio supplementing your dog’s diet will be important for them to build muscle due to the high amount of calories burned when performing cardio exercises. Not only is this great for your pup but also yourself. The more you active you both are the better off you both will be. Starting off by walking your dog daily and then increasing the distance and pace is probably the most fundamental exercise you can do for yourself and your dog. Not only is running great for cardio but it also engages the dog’s shoulder, hip and leg muscles. To get the best benefits from this run or walk hills. Uphill sprints are one of the best exercises out there but it is important to take it slower on the way back down. Going downhill slowly will help curb the impact on their joints. If you are not up to run with your dog you can give them a higher intensity workout by putting a weight vest on them while you walk. Once again it is important to start with low or no weight and slowly increase the amount your dog is carrying. Most dogs love to play fetch. This is easier for you if you are not up to walking or running with your dog and lets them sprint for short distances. Also if you use a frisbee or something they can catch you are exercising their legs even more than just a walk. A great game that is fun and helps build muscle. Your dog will be engaging their legs, hips, shoulders, and jaw. Swimming or playing in water is a great low impact exercise that helps strength and is great for range of motion as well. I especially recommend this if you have an older dog who is experiencing any kind of discomfort. This is the best form of exercise for a dog with arthritis because there is no impact like there is with running or jumping. The jumping and running as well as the biting on their toys while using these are two of the best exercises you can do for your dog. The most important thing to remember is to combine proper nutrition with exercise This means finding the best dog food you can. And, if you are working your dog out it is beneficial to supplement their diet. The amount of calories they burn while working out may cause them to lose weight if they are under nourished. Step one, get your dog on a good diet, step two, get out and get moving! Your dog and your waistline will thank you.